When I was a child I used to spend hours contemplating a globe. It belonged to my father, I inherited it, it has yellowed a bit. It is similar to all those that are mass-produced for a reasonable price, with a 23°27 inclination. In order to explain that the sun is at the centre of the solar system, science has put us in its place, turning us into erudite stars. The earth’s inclination is invariably 23°27 and our eyes wander across a surface whose summit is the North Pole. In the past, only the very rich could afford such objects, but they were then very different from those you can find today. They were built inside two revolving circles. The vision of the earth that they proposed could vary : it could revolve in the direction one chose, be orientated according to one’s wishes, there was no question of becoming either the sun or the moon. Faced with such a luxury article, one was necessarily a rich and learned human being. And that was that. The earth was on the table : I was on a chair. At a very early age, I was able to contemplate the Southern Hemisphere. I could read Zanzibar as if I were on the spot. According to science, I was necessarily in winter. Later on, when my eyes reached the equator, .I could imagine that I was the moon . Sabine Réthoré is a cartography artist who lives and works in Sète (France). 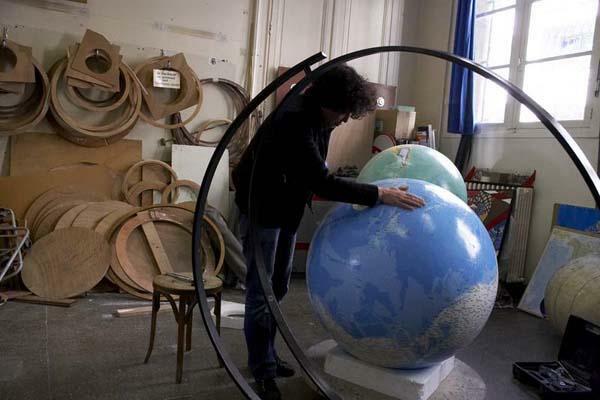 She builds giant globes, draws maps both precise and poetic. Models of artistic globes and photographs of luxury globes. A wide range of luxury globes and unique collectors’ pieces. Pictures of globes and maps of the world in two hemispheres. A collection of globes for interior decoration. Giant globes and decorative design globes intended for large interiors. Creation of artistic maps, of maps meant for collectors with a passionate interest in art and geography. Rare or artistic maps for use in interior decoration. Reversed maps, world maps, in short a special library of maps that respect topography but leave room for fantasy. Addresses for amateurs of special globes and exceptional maps. The different stages of the fashioning of a hand made globe. Interior decorator in woodwork. Description of the fashioning of a globe and of the globemaker’s work. Creation of wooden globes and maps of the world in two hemispheres, from the shaping of the sphere to the drawing of the maps. A pink hand-painted decorative globe on the theme of the Earth-mother. This luxury map of the world in two hemispheres represents an upside-down world, a combination of reversed cartography and classical annotation. A luxury two-hemisphere map of the world for the decoration of a study or a sitting room. A luxury globe on an eccentric axe revolving around the Mediterranean sea. Sao Tomé is a geopolitical globe that changes round the present-day reading of the world. Photographs of a globe made for the Plaza Athénée in Paris. A wooden map in two hemispheres, made entirely by hand. An example of a prestigious globe made to order for a luxury hotel.